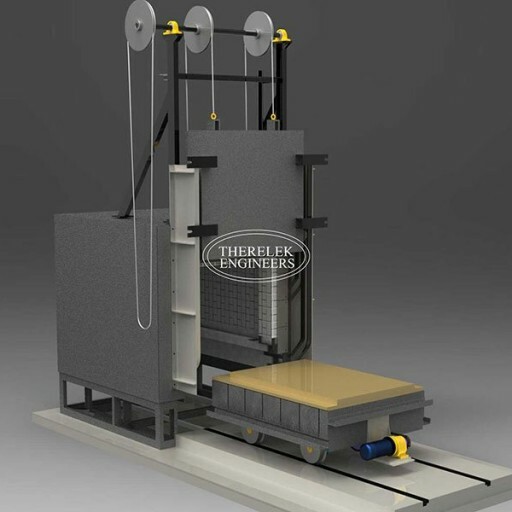 When the weight and volume of the product is beyond normal handling limits, the product is loaded directly on to a trolley or bogie which along with hearth travels in & out of the furnace. Loading is done by means of EOT cranes, stackers etc. Bogie hearth furnaces are classified as low temperature furnace and high temperature furnace. Low temperature furnaces work within 100 – 450°C. Generally, as this temperature heat transformation can take place only by convention, air circulation is provided which circulates air from the chamber to the impeller, the air passes through heaters and reenters the chamber. This circulation continues. There is counter flow type air circulation where in air is circulated perpendicular to the hearth and enters the chamber at the bottom or either side. There are unilateral usual flow type furnaces wherein air passes across the hearth. Generally, to get uniformity the furnaces are designed to 20, 30 & 50 times the volume of circulation of the chamber per minute depending on the temperature accuracy required. High temperature furnaces do not require air circulation as radiation starts emitting above 800°C which conveys heat throughout the chamber. In order to conserve energy, usually high quality ceramic fibers and boards are used in these furnaces. If the furnace is continuous in nature wherein the question of switching off the furnace does not arise. Ceramic bricks of appropriate quality is used. This retains heat and incase of intermittent power supplies the parts are not subjected to huge variations. Bogie Hearth furnaces are used for stress relieving, normalizing heating of forging billets. They are also used for pack carburizing, annealing wherein temperature raising and cooling rates are to be controlled precisely to meet the quality requirement of the material. Furnaces are designed with rate of heating and cooling by forced air circulation and venting of hot air etc. Bogie hearth or car bottom furnace is considered to be a large batch furnace with an insulated car or bogie moved out of the furnace for loading and unloading. Bogie is sealed to the furnace using a solid seal or a granular type seal. The bogie of the furnace is self-propelled with motor drive mounted on it. The bogie is then moved in and out by a floor mounted drive with continuous chain or rack and pinion drive. The bogie type furnace are non-atmosphere furnaces since it is difficult to seal the car. Bogie hearth furnace comes with electrically heated or gas fired or oil fired heating systems with resistance elements. These furnaces are heated from room temperature to a control temperature at a specific rate, hold at the control temperature for certain time and then cooled down to discharge temperature at a specified rate forming a typical cycle. PID controllers are used to store variety of heat treat cycles including process monitoring and recording of historical data. Ceramic fiber insulation provides extreme control of furnace temperature when following a programmed cycle. Ceramic fiber has minimal heat storage capacity compared to hard refractories by heating and cooling at faster rates. Thus less heat is required to bring the furnace to desired temperature and thus making the difference minimal as the total heat is based on the mass of the load. Continuous heating and cooling cycle has minimal effect on ceramic fiber lining. In the process of stress relieving car bottom or bogie hearth furnaces are used from lower ranges around 540oC to temperatures over 1095oC. Due to furnaces being exposed outdoors increased allowances shall be made for thermal holding losses caused by winds and other ambient changes. Our Bogie Type furnaces are suitable for heat treatment of large and heavy loads and are designed to operate upto 1150°C. The parts or charges loaded onto a furnace are heavy and require material handling facility. When the hearth moves out of the furnace heating chamber, parts are loaded by means of an electrical overhead crane (EOT). If required, special charge loading mechanisms can also be provided based on the user’s job profile, lack of material handling facility or overhead space constraint. The bogie movement is motorized for easy handling. Similarly the door movement would be with motorized gear drives or hydraulically / pneumatically actuated. Our Bogie hearth is used in applications like Annealing, Stress Relieving, Hardening, Tempering, Normalising, Post Weld Heat Treatment, Wire Annealing, Case Hardening, Blueing, Austempering, Austenitizing, Homogenizing, Billet Heating, Pre-Sintering, Sintering, Mould/Core Heating and Preheating/Preheating for forging.